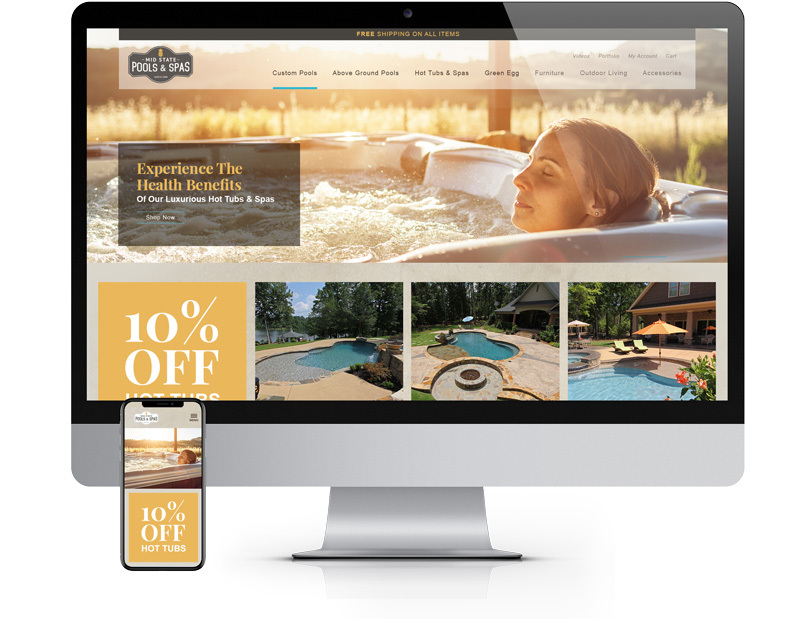 Mid State Pools is a custom design-build pool, spa, and outdoor living company with a large retail store, selling Big Green Egg, YETI, swimming supplies and accessories, and outdoor furniture. We have worked with Emerson Fromm since 2011 and with his and Barrett's team at Mid State Pools since 2015. Mid State Pools is celebrating their 30th year and M&R has served as their marketing agency since 2015. As they looked to expand services and have a more concentrated focus of retail sales, we were challenged with launching a comprehensive digital campaign to attract clients. Having helped them grow and maintain a very successful pool business, we were now challenged with increasing sales of above ground pools, hot tubs, and retail items. All of Mid State Pool’s digital platforms have seems dramatic increases in following, engagement, and conversion. Through creating consistent and strategic monthly promotions, his eNewsletter reach has seen an increase of 1,300%. M&R Marketing has been our agency since 2011 and we’ve seen strong growth each year. They handle 100% of our marketing – digital, video, web, social, strategy, you name it. We meet weekly to strategize our promotions and they provide updates on what’s running, how everything’s performing, and we review creative. Their team is incredibly accessible, know our brand as well as we do, are honest, and they are completely unbiased when making recommendations – it’s always about what’s best for Mid State Pools. I have an enormous amount of trust in them – they are as good as they come.